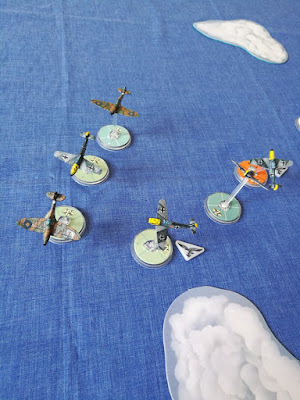 Kenzie's Tabletop Gaming Blog: Blood Red Skies - Battle Report - Dogfight over the English Channel. 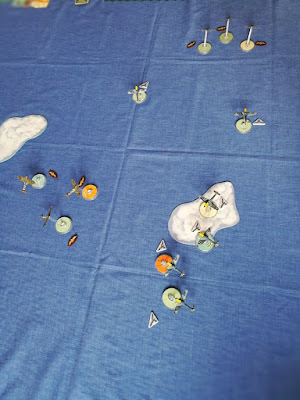 Blood Red Skies Battle Report. 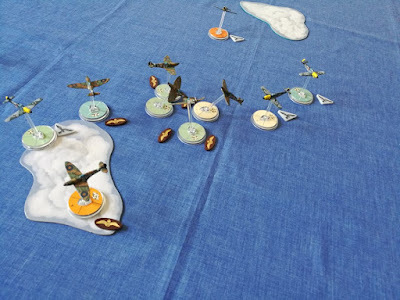 It's 1940, the Battle of Britain rages on, the Luftwaffe increase their attacks on the Isle of Great Britain. 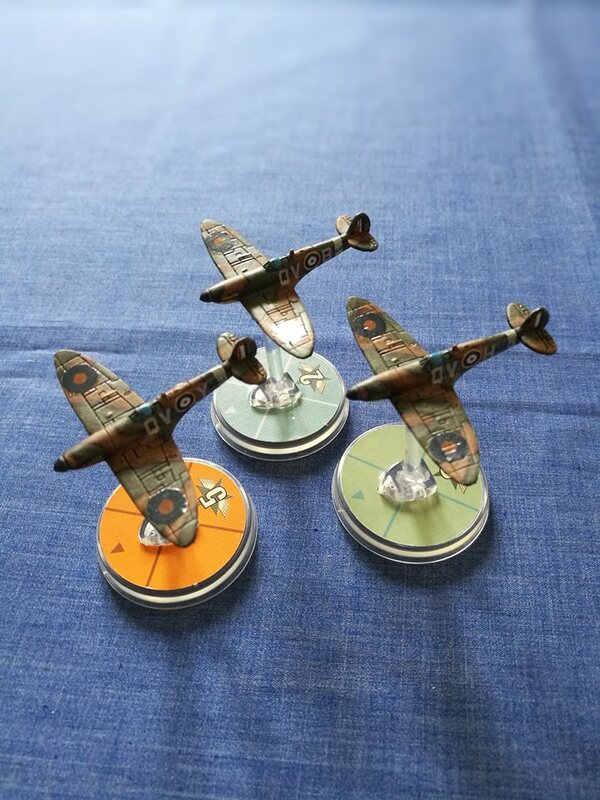 The R.A.F Spitfire pilots are given the order to "Scramble", and soon the Spitfires were in the air. 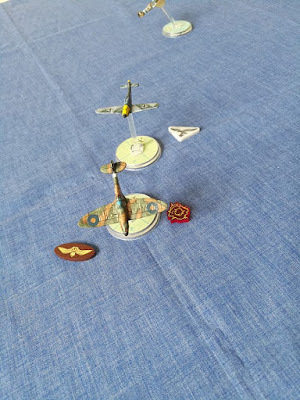 The battle report was played with just the contents of the Battle of Britain starter set. 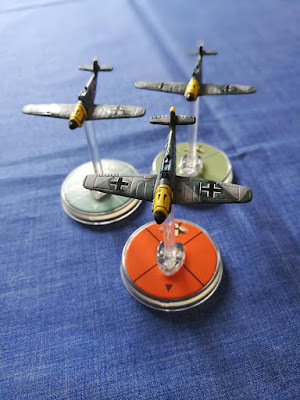 At the time of writing the Blood Red Skies basic rules are available free from the Warlord games website here. 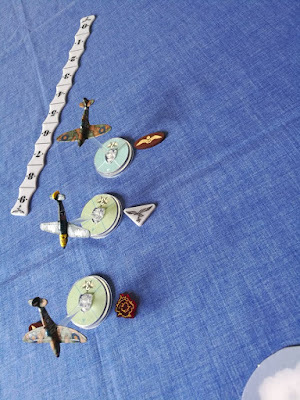 The player that receives more Boom chits than they have aircraft remaining in the squadron it then retreats from the table at the end of the current turn, and the last player to have aircraft on the table wins. 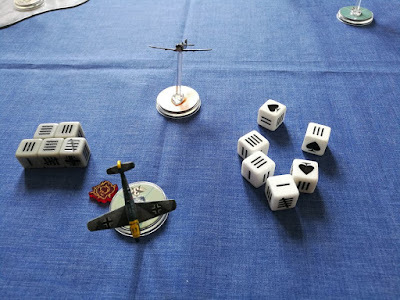 Boom chits are given when an aircraft is hit even if it dodges. Set up and starting advantage. Luftwaffe played the Theatre card Clear Skies causing two clouds to be removed. The R.A.F played Radar Support and now have the jump on the Luftwaffe raiders and four out of the six Spitfires start advantaged. Clear Skies over the Channel. The Luftwaffe Veteran hides in the clouds as the advantaged Spitfires approach. R.A.F Spitfires finished the turn in the advantaged position. 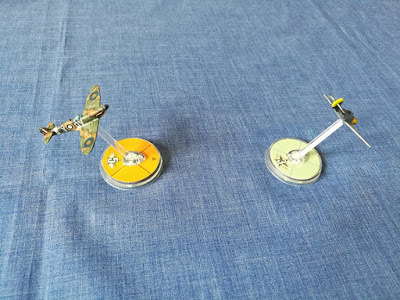 The Spitfire Ace Tight Turns and picks off a rogue BF109. 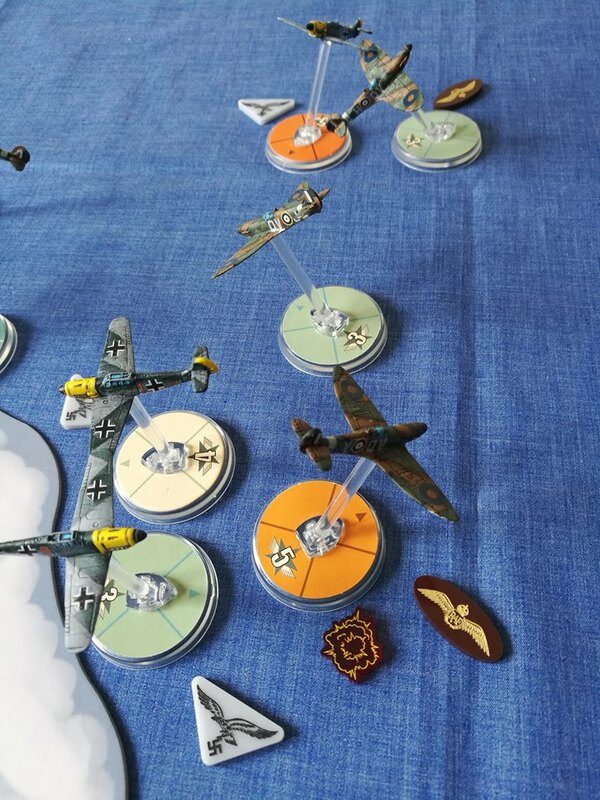 The BF109 is shot down by the Ace and crashes into the waves. Luftwaffe Pilot splashes down in the English channel. 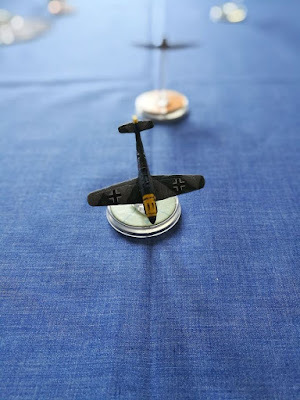 The Luftwaffe is given 2 boom chits. The Veteran Spitfire takes the chance and takes a head-on shot against the German, but is unable to get a shot on target, the German hits back and scores a hit and reduces the advantage level of the Spitfire Veteran. All three Spitfire attacks miss the lone BF109, and the return fire is devastating, landing 3 Boom chits on the R.A.F squadron. 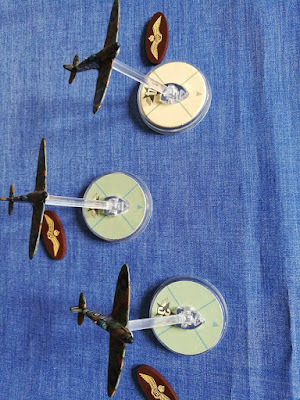 Adding further insult the Spitfire Ace also gets tailed from a Luftwaffe Rookie who gets a hit but the Doctrine card Defensive Tactics a with a Tight Turn card makes it just a deflection shot (side on) and the Ace is still in the air. 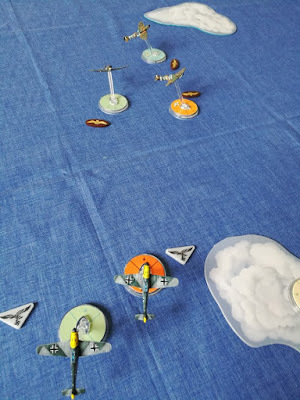 The Spitfire Ace has the Veteran Luftwaffe pilot on his six and he can't seem to shake him, the Spit gets riddled with bullets and it's still in the air. 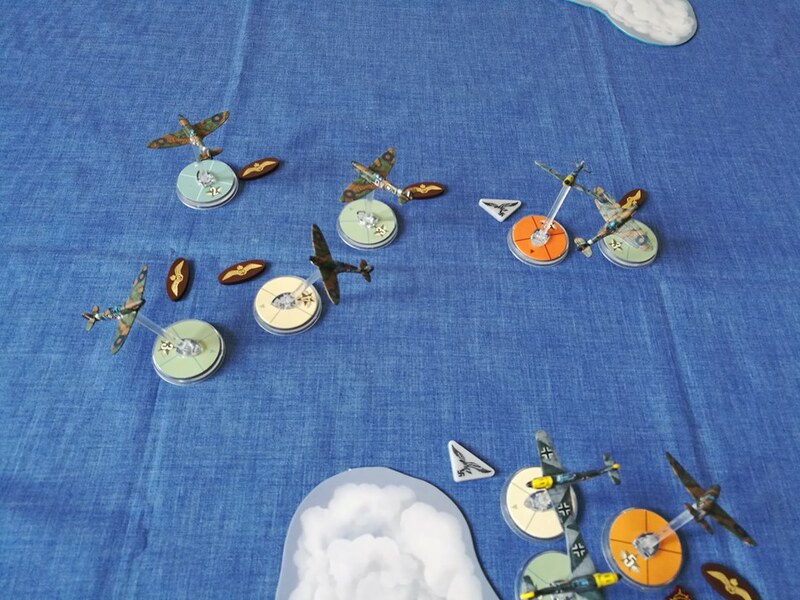 Another boom chit for the R.A.F. The British start using the clouds for cover. 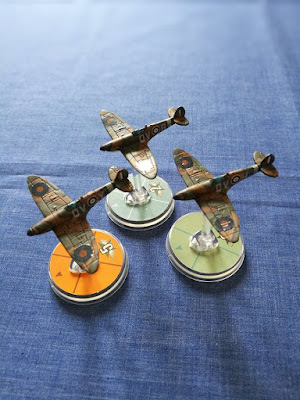 Spitfire Pilot gets a 109 on its six. In a quick-thinking move, the 109 manages to tail the Spitfire Pilot, hitting its target but unable to take it down. 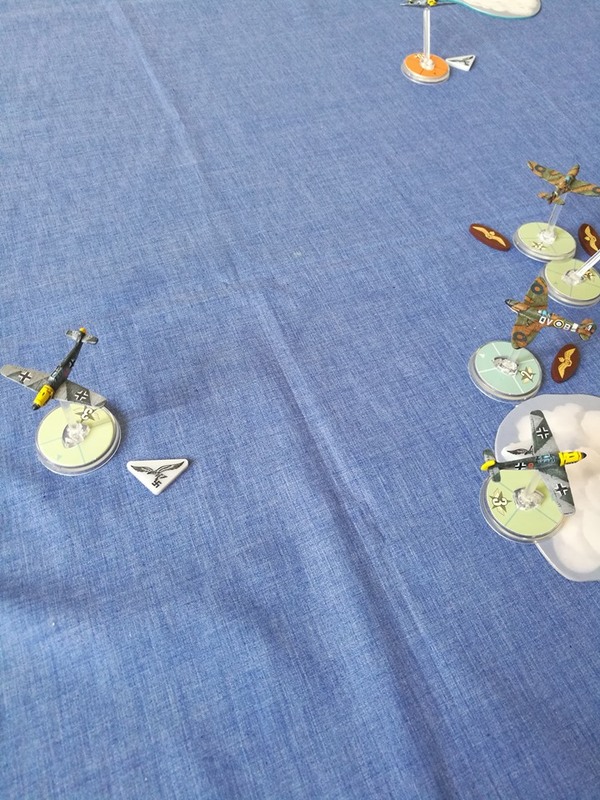 Another Boom chit for the R.A.F. 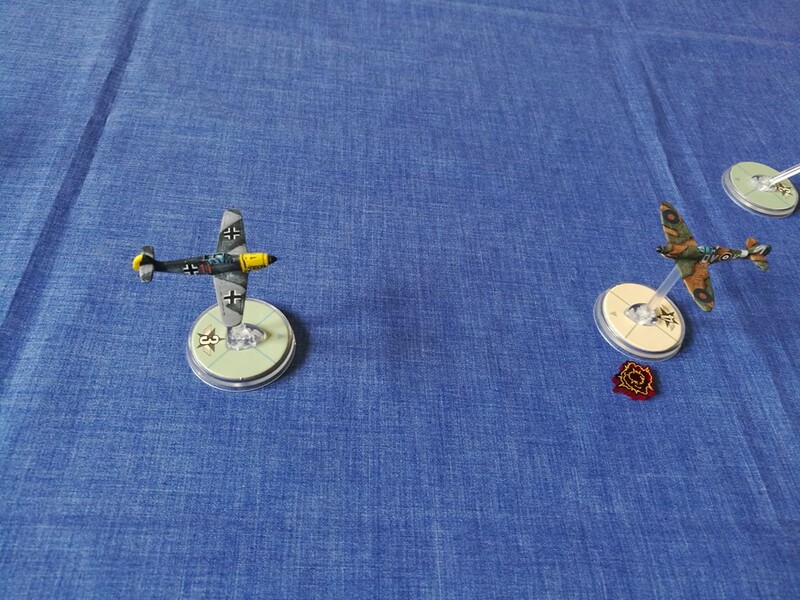 The tailing BF109 Pilot gets tailed too, by a Spitfire Rookie. 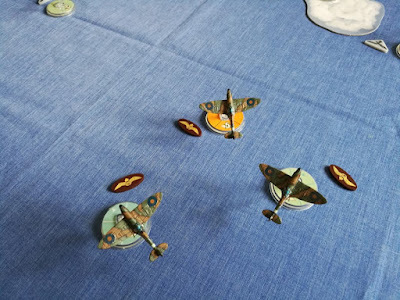 Seeing the chance to make a name for himself the Spitfire Rookie relieves his fellow pilot and but couldn't land a hit. Only one more hit and the R.A.F will call the withdrawal. The Spitfire Ace takes another hit, the Luftwaffe Veteran tailing furiously, another Boom chit, but the British play Home Advantage and ignores the Boom chit. 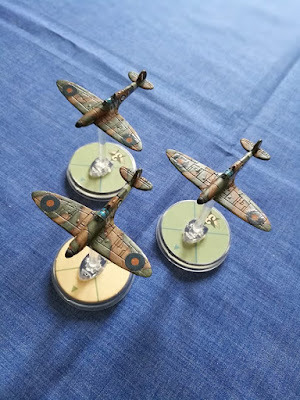 The R.A.F are still in the game. The Spitfire Veteran takes a pot shot at an unlucky Luftwaffe pilot and the rest of the squadron watches on as the BF109 plunges into the water. 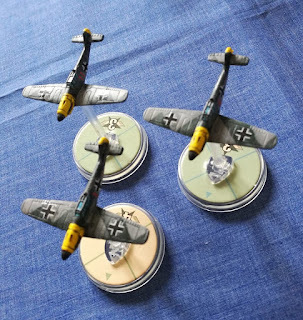 Another 2 Boom chits for the Luftwaffe, only four more of the raiders left. The clouds act as a quick respite for the Spitfire Ace. One more hit for either force and they'll withdraw from the battle. 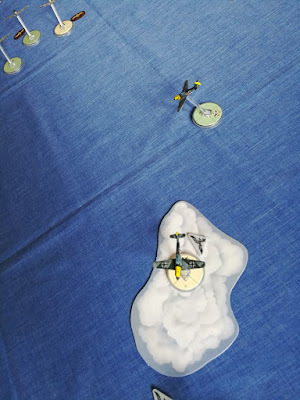 Dogfighting over the English Channel at the end of the fifth turn. The Luftwaffe Pilot bursts from the clouds behind the Spitfire Ace and manages to land a hit. 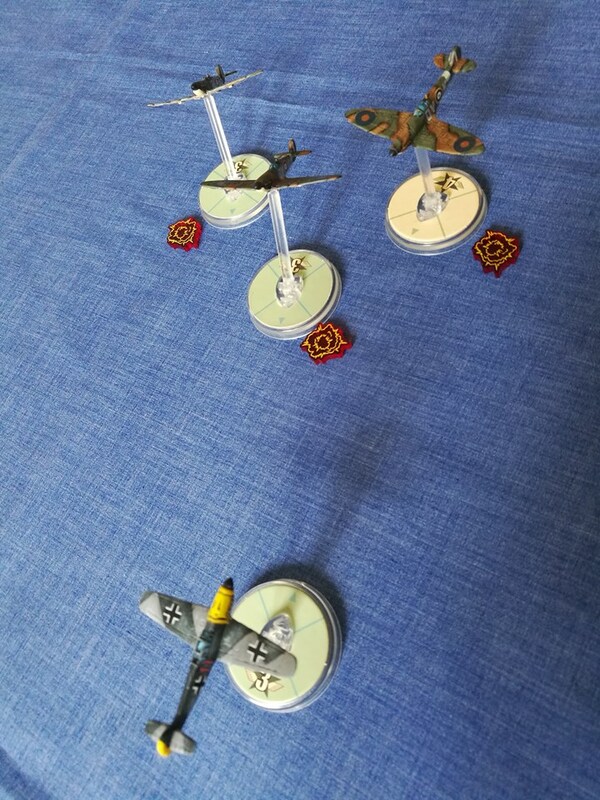 No serious damage but the R.A.F makes a tactical retreat. The R.A.F Ace takes the 7th and final Boom chit and orders the squadron to withdraw. The Raiders lost two aircraft whilst the R.A.F were shot up a lot. 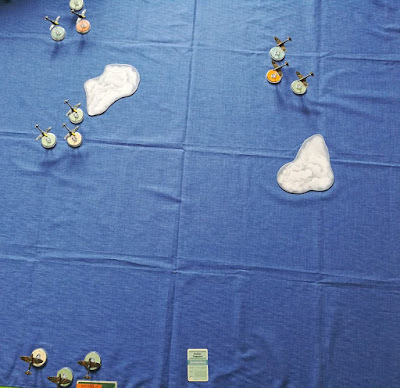 enough to make them retreat. 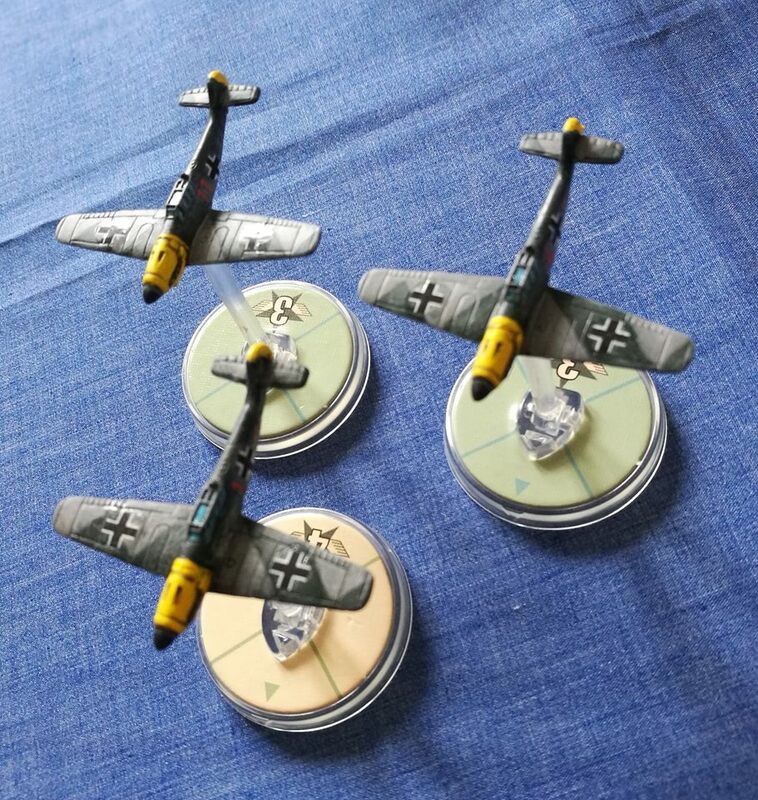 The R.A.F did make the shots count by downing every BF109 they hit. 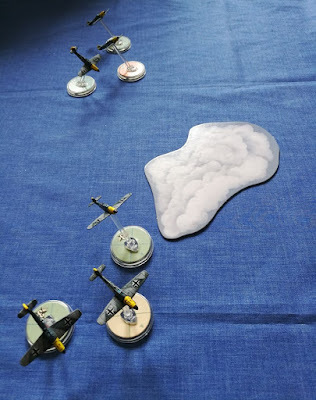 I hoped that you enjoyed the battle report.